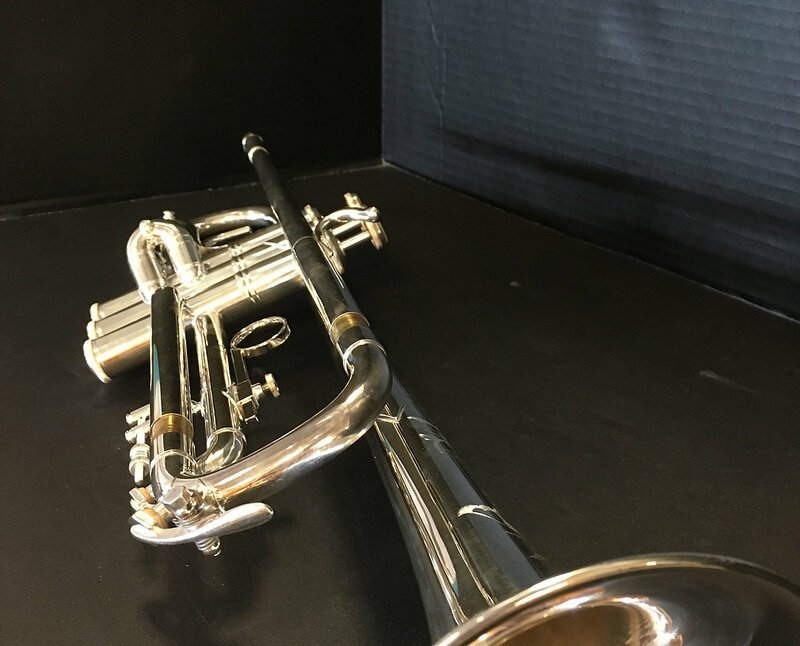 .459" Medium-large bore, 4-3/4" two-piece yellow brass with silver plating with engraving based on Bach Stradivarius #37 design. Soldered bell rim wire, #25 Bach Stradivarius lead pipe. One piece Stradivarius-style valve casing. Monel metal pistons with two-point nylon valve guides and enclosed barrel-shaped bronze valve springs. First valve slide thumb hook, adjustable third valve slide finger ring and stop mechanism, engraved bell, genuine Vincent Bach mouthpiece and wood shell case. The Omega series was a dealer exclusive alternate to the stradivarius line. These have similar characteristics and features with a different engraving, allowing them to be sold at a much lower rate for very close quality.